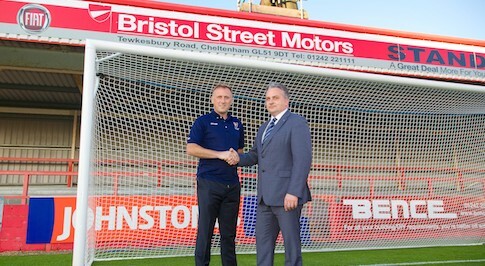 Bristol Street Motors multi-brand site offering Fiat, Alfa Romeo and Mazda in Cheltenham has joined forces with Cheltenham Town Football Club in a one year sponsorship deal. The Tewkesbury Road dealerships will become the sponsor of the Prestbury Road End Stand at the Robin's Whaddon Road ground and will also have banners placed around the stadium. Currently in League Two, Cheltenham Town Football Club are led by Mark Yates who has held the position of manager since 2009. Nicknamed the Robins, Cheltenham Town won the Football Conference title in 1999 achieving full league status for the first time. Paul Pritchard, General Manager at Bristol Street Motors Cheltenham, said: "The Robins are a very well respected football club with a loyal following and we are proud we could work together. Sport is important to the people of Cheltenham and the football club is at the heart of the community. Bristol Street Motors is pleased to be working alongside them. "We wish Mark and his team the very best of luck for the rest of the season." Marie Carter, Marketing Manager at Cheltenham Town Football Club, said: "We are very pleased to be working with Bristol Street Motors Fiat, Alfa Romeo and Mazda in Cheltenham. "Support from local businesses is so important to a club at our level and we are grateful that Bristol Street Motors is one of our lead sponsors."